Melissa Lemon Balm Ointment (Melissa officinalis) is one of the top choices for natural herbal healing of herpes virus and herpes cold sores. In German scientific studies, Melissa officinalis (lemon balm) has been shown to contain the active herbal properties of tannins. It is the tannins in the herb that contain certain polyphenols. In addition to using the lemon balm herb, we also add 100% natural lemon essential oil as a natural preservative. We recommend avoiding products containing artificial preservatives. Melissa also contains the healing power of terpenes. These active herbal ingredient are what gives Melissa Ointment it’s antiviral, anti-septic, and anti-fungal healing properties. In particular, the polyphenols and terpenes help to combat and heal cold sores due to the herpes simples virus. When applied to the affected area, Melissa Ointment helps heal the cold sores in about 2-4 days. The ointment also helps to double the time between outbreaks. Apply a small amount of cream to affected area 3-4 x a day during out breaks. Be sure to cover entire sore. Dab on, and rub in gently so the sores do not break open. Ointment should be used 1-2 x a day during non break outs to keep the herpes virus at bay. Cloverleaf Farm’s Melissa Lemon Balm Ointments/Cream can be used on all forms of the herpes virus to help naturally heal the lesions more quickly. Make sure not to get it in the eyes. It is meant for skin application only. Use it daily to keep flare ups at bay. Be sure to wash hands before applying cream. Be sure to not “double dip” into the jar. This can contaminate the cream. 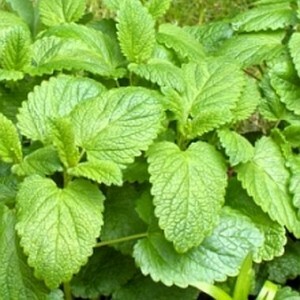 Lemon Balm (Melissa officinalis) should not be used by people who are taking medicine for thyroid problems. To purchase Melissa Lemon Balm Ointment and other lemon balm items securely online, please visit our secure online store.